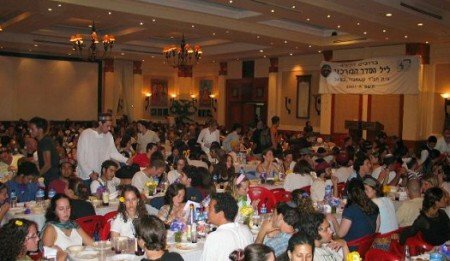 Katmandu Seder Will Be Cancelled? The Foreign Ministry strike may cause the cancellation of the world’s largest Seder, organized by Chabad in conjunction with the Foreign Ministry, in Nepal’s capital of Katmandu, Foreign Ministry spokesman Yigal Palmor told The Jerusalem Post on Sunday. Each year there are more than 1,000 people at the Seder in Katmandu, which has kosher food dispatched from Israel by the Foreign Ministry and signed for in Nepal by the embassy. For some who had no previous contact with religion, and no particular curiosity about their heritage, the Passover experience in Katmandu has proven to be a turning point in the lives of some, according to various sources who had participated in the past. Because of the general strike by Foreign Ministry employees, who are demanding pay increases and better working conditions, there will be no transport of food products from Israel to Nepal in time for Passover, Palmor said, less than two hours after the general strike was declared. Reminded that the early reading in the Hagaddah invites all who are hungry to come in and eat, Palmor responded with reference to Foreign Ministry staff who have not received a fair deal from the Finance Ministry and whose salaries are not commensurate with what Foreign Ministry personnel do for the state. Attempts to contact Rabbi Chezky Lifshitz, Chabad emissary in Katmandu, have failed, as was an attempt to contact the Israeli office of Chabad Katmandu. Rabbi Duber Levitin, secretary of Tzeirei Chabad at Kfar Chabad, said the Seder might still take place, but said he could not speak on behalf of Lifshitz. If Chabad wants to keep the Seder going, it will have to find other means of getting the necessary supplies.